In 1849 a Russian court sentenced Fyodor Dostoevsky to death for his links to an anti government intellectual group (although his sentence was later reduced to hard labour), in 1945 UNESCO (United Nations Educational, Scientific and Cultural Organization) was founded and the German composer Paul Hindemith was born in 1895. 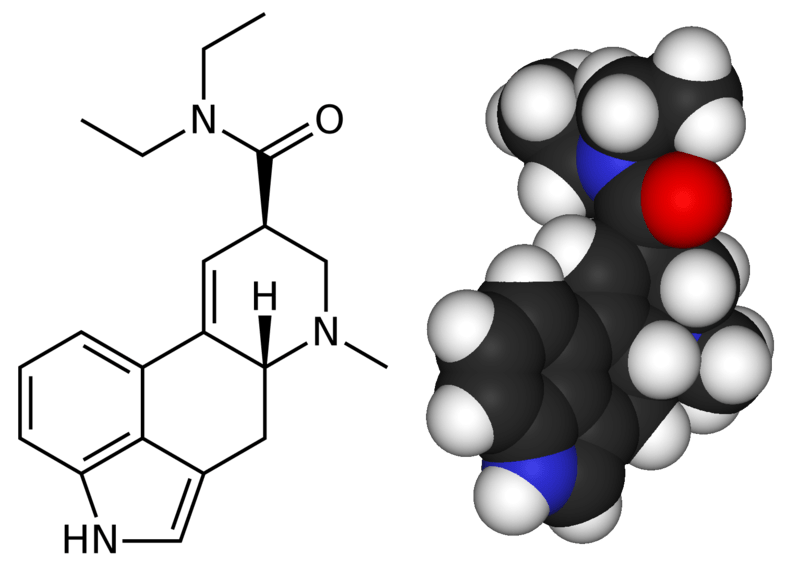 In 1938 LSD was first synthesised by Dr Albert Hofmann, LSD – or (6aR,9R)-N,N-diethyl-7-methyl-4,6,6a,7,8,9-hexahydroindolo-[4,3-fg]quinoline-9-carboxamide, more commonly known as Lysergic acid diethylamide – is a class A drug in the UK. This means that possession of the drug without a license is punishable with 7 years imprisonment and/or an unlimited fine, and trafficking is punishable with life imprisonment and an unlimited fine. LSD is very potent and just 10-20µg (micro grams) being the threshold dose for a human. Why was LSD first Synthesised!? LSD is a derivative of the ergot alkaloid family which were under investigation at the time as they are vasoconstrictors which have been shown to improve migraines. However when Hofmann first ingested (by accident) a small portion of LSD he had a much stronger reaction than expected. LSD was first used as a psychiatric drug in the late 1940’s. Research into LSD began in the 1950s the Central Intelligence Agency began a research program code-named Project MKULTRA. Experiments included administering LSD to CIA employees, military personnel, doctors, other government agents, prostitutes, mentally ill patients, and members of the general public in order to study their reactions, usually without the subject’s knowledge. The project was revealed in the US congressional Rockefeller Commission report in 1975. LSD is still a banned substance in the UK, however after many years LSD is now the subject of much medical research, there are interests in its anti-cancer properties as it is able to alter the blood vessels near a cancer. This entry was posted in Molecule of the week, On this day, Random and tagged Albert Hofmann, Drugs, Fyodor Dostoevsky, Fyodor Dostoyevsky, Lysergic acid diethylamide, Molecule of the Month, Paul Hindemith, Project MKULTRA, Psychoactive drug, Stimulant, UNESCO. Bookmark the permalink.